This one is my tried and true cheesecake recipe. I love it. This is such a good recipe. The texture of the cheesecake is dense, light, and fluffy at the same time. The strawberry topping adds a wonderful tartness. And the Oreo crust is addicting. The only thing that I would change is the preparation of the crust. I think it cooks better when it is a single-layer, not packed against the sides, and when I put the prepared crust in the fridge before baking. Otherwise, there can be parts of the crust that do not crisp up (still good, but not perfect). Of all the desserts we had at Easter dinner, this dessert was the show-stopper. I have a feeling this is going to be requested over and over again. I’ll just have to convince everyone to try other variations, so I can keep experimenting! Use Cuisinart food processor to blend cookies into fine crumbs. Melt butter and, in separate bowl, mix well into the crumbs. Pour the buttered, sugary crumbs into the springform pan, and firmly press the crumbs into the bottom of the pan (don’t go up the sides, it’s easier). Cover and refrigerate until cheesecake is ready. For the cheesecake: In Cuisinart food processor, beat softened cream cheese, sugar, and heavy cream until smooth (maybe :30 to 1:00 or less). Add in vanilla and ricotta, then mix until incorporated. Add eggs, one at a time, and mix until just incorporated. Pour into prepared springform pan. Remove baking sheet from the oven and allow the cheesecake to cool. Transfer springform pan from the water bath once it has cooled, and allow cheesecake to cool completely. Cover and chill in the refrigerator overnight. For the topping: Puree strawberries in a blender and pour through a mesh sieve a few times to remove as many of the seeds as you possibly can (doesn’t take too much for strawberries). This should make about 1 cup of strawberry puree. Whisk strawberry puree, sugar and cornstarch in a small saucepan until blended, bringing mixture to a boil over medium-high heat and cook, stirring constantly, 1-2 minutes or until slightly thickened. Remove from heat and let cool. 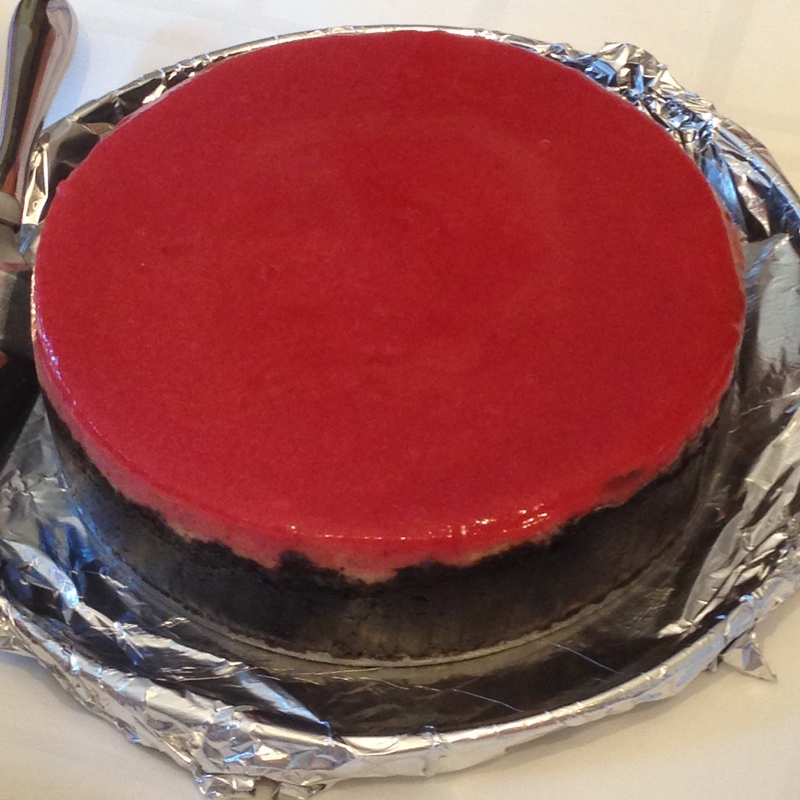 Spread cooled strawberry topping evenly over chilled cheesecake (may need to heat puree slightly to loosen it up).